Foursquare for BlackBerry 10 updated | BlackBerry Blast! 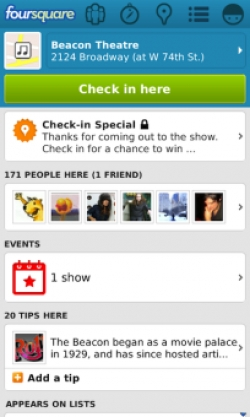 Foursquare has updated its BlackBerry 10 app to bring it more in line with the features that iOS users already enjoy. BlackBerry users can now take advantage of Visa and MasterCard specials. There is also a more compact Explore screen. Check out the link below for the updated version. Foursquare helps you and your friends make the most of where you are. Join the over 25 million people who are already on Foursquare and download the free app! ✓ Share and record the places you visit. ✓ Search for the best places to go. ✓ Get personalized recommendations and deals based on where you and friends have been. ✓ Discover insider tips and lists from local experts, brands, and celebrities.